That’s one of the reasons I came to NBCF, to create a dedicated school for visually impaired kids. Nevada is one of just five states that does not have a school for the blind. We’re going to change that. Emily Smith, executive director of the Nevada Blind Children’s Foundation, with her dog, Buddy. A: “All In: How the Best Managers Create a Culture of Belief and Drive Big Results” by Adrian Gostick and Chester Elton. It’s the latest book from the team who wrote — what I consider to be the bible on company culture and how to create it — The Orange Revolution: How One Great Team Can Transform An Entire Organization. Q: Where do you take clients for dinner or lunch? A: DW Bistro and Nittaya’s Secret Kitchen are a few of my favorites, depending what side of town we’re on. But if you really want to connect with somebody, I like sharing a pizza. A: On Monday nights, you can find me at Sunset Station, bowling with my friends; and Thursday nights, I golf with the Nevada Blind Children’s Foundation team at the Las Vegas Golf Center. On weekends, I love to golf with my son, usually at Bear’s Best or the Paiute Golf Course. The main thing is we get to spend that time together. A: I’m a happy, non-recovering workaholic. It just doesn’t feel like work when you love what you do. 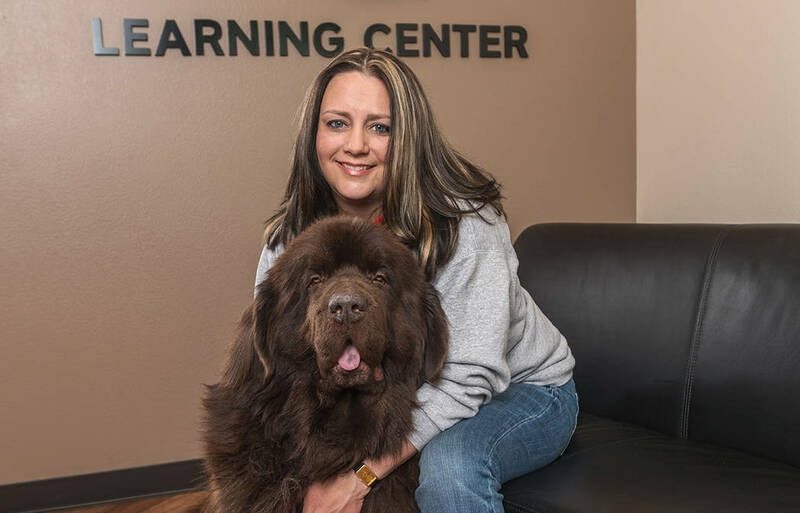 That said, it also helps that we have a relaxed company culture at Nevada Blind Children’s Foundation so I can bring my “newfie” Buddy (Newfoundland) to work with me. We’re a certified therapy dog team, and he’s become the NBCF mascot. Buddy has such a calming nature — the kids love him and so do I. A: Education — the same challenge we’ve faced for the past five years. Our community needs the best and brightest minds to lead us into the next 100-plus years. An investment in our kids, today, will literally reap dividends for us in the future. No pun intended, but I never saw this more clearly than when I came to Nevada Blind Children’s Foundation. It’s estimated 70 percent of blind adults are unemployed; and literacy is a key component to changing that fact. During their lifetime, unemployed blind adults will cost their community an estimated $1 million dollars each. However, for a fraction of that cost, we could educate our visually impaired youth and help them become independent, contributing members of our community. That’s one of the reasons I came to NBCF, to create a dedicated school for visually impaired kids. Nevada is one of just five states that does not have a school for the blind. We’re going to change that.